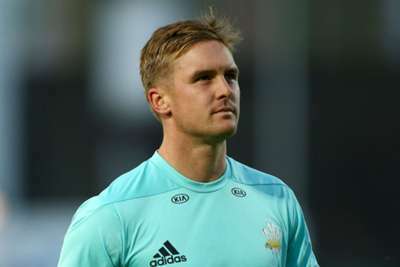 England international Jason Roy was embarrassed and apologetic after ruling himself out of a crucial Twenty20 Surrey match by bouncing a bat into his own face. Roy, capped by his country at Twenty20 and one-day level, is a key man for Surrey, but his county will be without the batsman for Friday's T20 Blast clash with Glamorgan. The 28-year-old was out first ball against Hampshire on Wednesday and angrily retreated in the dressing room by smashing his bat against the ground and injuring himself on the rebound. And with the ailment forcing Roy out of the trip to Cardiff on Friday, he was forced to reveal the unfortunate incident. "I am really disappointed to be missing out on the game," he said. "Following my dismissal on Wednesday evening, I threw my bat into the ground purely out of self-frustration. It bounced, hit me and, as a result, I sustained the injury. "I'm extremely embarrassed and apologetic to my team-mates and fans for this moment of stupidity. I want to apologise to Surrey as a club and all the members. "I've never been so motivated and so positive about my game and I assure you I will learn from my mistake as I am my own biggest critic."